Ruby is the red variety of corundum. It is quite a bit rarer than the blue gems. 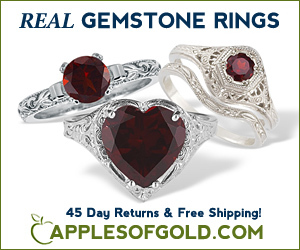 The rarity combined with the demand for rich red gems keeps the price very high! When it comes to quality and price we are the online shoppers best resource. .
Ruby has accumulated a host of legends over the centuries. People in India believed that rubies enabled their owners to live in peace with their enemies. In Burma (a ruby source since at least 600 ADГўв‚¬вЂќnow called Myanmar), warriors possessed rubies to make them invincible in battle. However, it wasnГўв‚¬в„ўt enough to just wear the rubies. They had to insert them into their flesh and make them part of their bodies. The name ruby comes from the Latin word ruber, which means Гўв‚¬Е“red.Гўв‚¬Вќ The glowing red of ruby suggested an inextinguishable flame burning in the stone, even shining through clothing and able to boil water.